Traditionally kelewele is ripe plantain diced and spiced with chilli and ginger and then fried. I prefer mine oven baked as it’s less oily. I also enjoy spicing it to suit whatever I’m eating it with. Cinnamon and nutmeg kelewele with ice-cream…. you’ve got to try it!! For even more plantain treats check out my book A Date with Plantain. It’s so versatile. Savoury versions go well with curries and roasted meats whilst sweet versions add something special to a dessert. Or simply enjoy on its own as a snack. 2 Replies to "Kelewele - diced and spiced ripe plantain"
Hi Tasleem, thanks for your lovely comment! Do try it baked, it’s lovely! I’ve got a supper on tomorrow evening and guess what’s on the menu!! 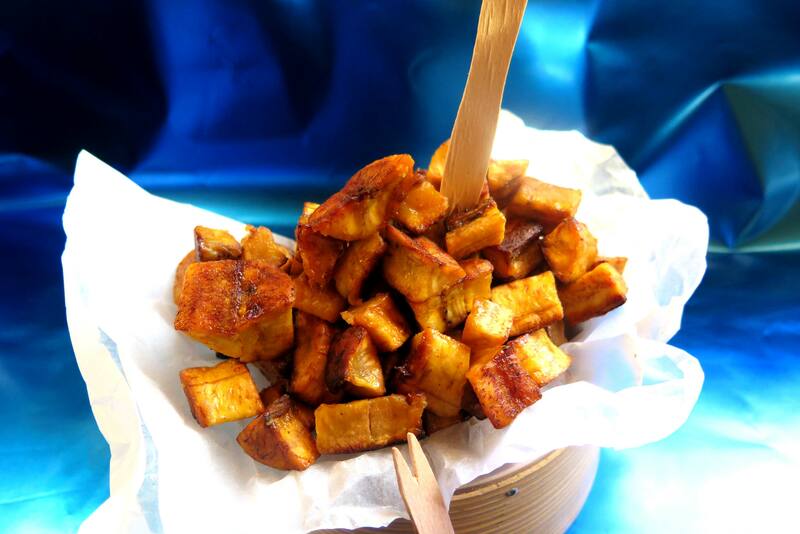 Oven-baked diced and spiced ripe plantain ‘kelewele’. Where are you from?